To capture the public's attention, your outreach website must offer a rich user experience that encourages two-way participation. Forming lasting relationships with your target users, and inviting them to participate in the conversation, is one of the best ways to guarantee the success of your online outreach campaign. Combining education with incentive programs helps drive people to act. There are many different types of incentives to choose from, whether it be tangible or virtual awards and prizes, the opportunity to compete, or simply receiving positive recognition among peers. Integration with social media sites helps further extend your reach by offering sharing and networking potential beyond that of a single website. Contact us for ideas on how we can help you build an online outreach campaign that's engaging, fun, and compelling. 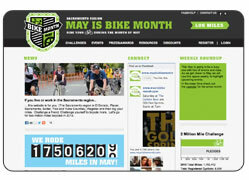 Since 2005 we have developed and maintained the acclaimed Sacramento May is Bike Month site, which lets nearly 10,000 area cyclists compete for prizes while collectively logging 2 million cycling miles. On YSP Connect, Sacramento-area Youth Service Providers create profiles, join discussion groups, and post news and events. An interactive map-based directory allows the public to locate youth services. 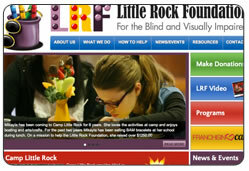 The Little Rock Foundation's website and blog provides extensive resource information for blind and visually-impaired children and their parents. They can also sign up to keep in touch with Foundation news, events, and program information.